His occupation was given as "hotel man." This is an estimate based on the birth of their first child, Edwin, in 1854. This shows the location of the homestead of Joseph Wyburn, Sr. and his family. The diagonal line above his land is marked as the Kenton Turnpike which is now Ohio Rte. 67 running diagonally across Kenton County through the county seat, Kenton. 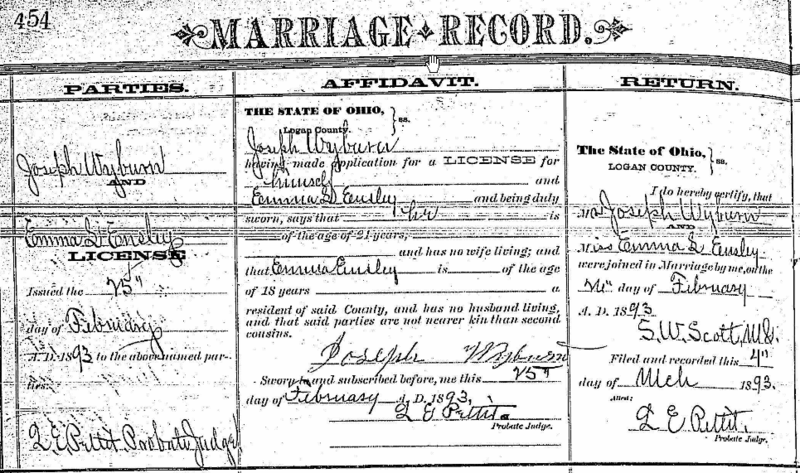 [S18] Death Certificate, Rushsylvania, Logan, Ohio, Reg. Dist. 348, File No. 8610. [S408] 1860 United States Federal Census, Mifflin Township, Wyandotte County, Ohio Page 162 Dwelling 143. [S113] 1870 United States Federal Census, Lynn Township, Hardin County, OH Pg 1, Dwelling 7. [S18] Death Certificate, Registration District 348, File No 8610. [S18] Death Certificate, Registration Dist. 348, File 8610. [S414] 1900 United States Federal Census, Rushcreek Twp, Logan County, OH, Page 7. [S9] Family Search (Church of the Latter Day Saints), Ohio County Marriages 1790 - 1950 Hardin County, Page 454. [S414] 1900 United States Federal Census, Rushcreek Township, Logan County, OH ED 124 Page 4A Dwelling 72.